Ravenswood, QLD. 26th June 2015. European settlers, mostly British, began moving away from the coast into the hinterland in the mid 19th C, looking for land suitable for cattle and sheep farming. 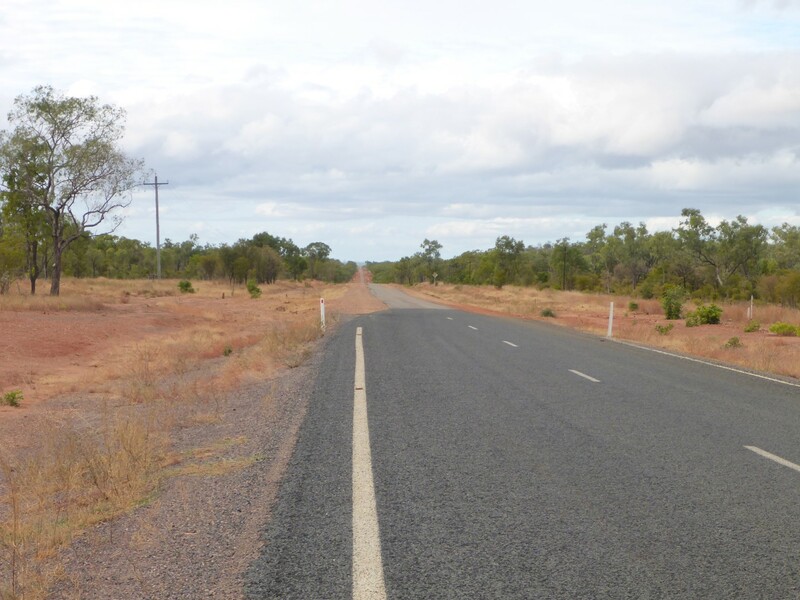 This process came about a little later in North Queensland and occurred as people moved up the coast and then into the outback. 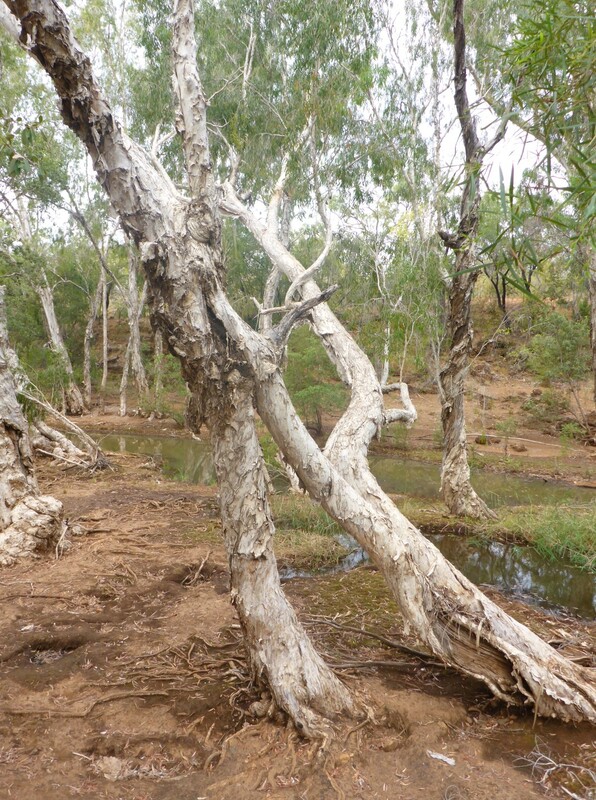 Unlike further south, were the weather is more settled, the outback has very wet and very dry seasons. This means that grass is thinner and less nutritious so vast areas of land were required to raise the profitable domestic animals. As far as the settlers were concerned the land was there for the taking, which is what they did, pushing the indigenous people out of the way, and squatting on the land. Moving stock the traditional way. 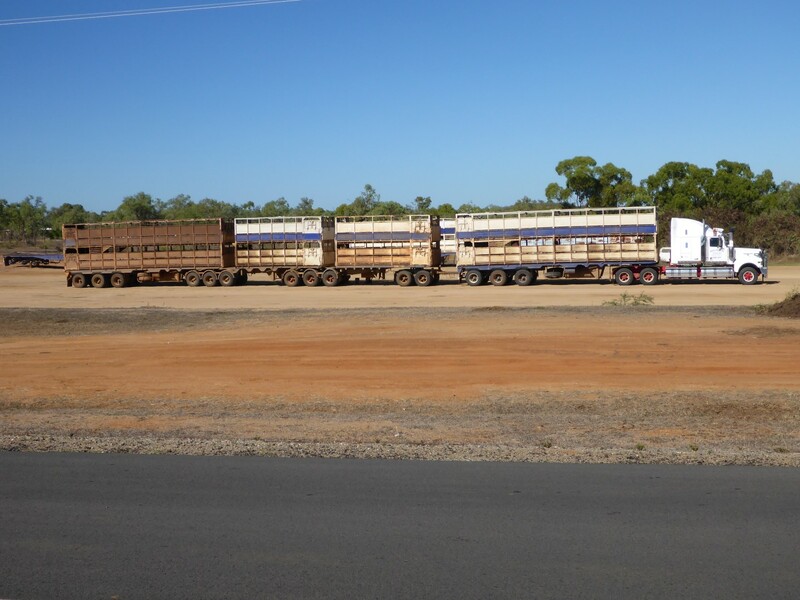 The cattle and sheep stations are huge, often thousands of square kilometres. Cattle replaced the sheep in most areas because of spear grass. It causes sheep to become sick because the tufted part of the grass has hair-like tendrils on it and they get caught in the wool. When they become damp they start to spin and find their way in through the skin and into the flesh. Cattle are less prone to it, especially the short haired variety. They can affect all animals, including us. There is a story about a dog who had one of these spinners go right through him and out the other side. When I left Ravenswood I took to a series of gravel trails, which short cut the road route. Good riding and an interesting view of the fire risk warning system here in Australia. In NZ the risk level goes from low to severe. In Australia it goes from low, via extreme, to catastrophic! And they mean it too, given some of the news stories from last year. Despite the seriousness, I couldn’t help being amused by the signs I saw as I rode through a military training area. Fire risk sign with a military twist. 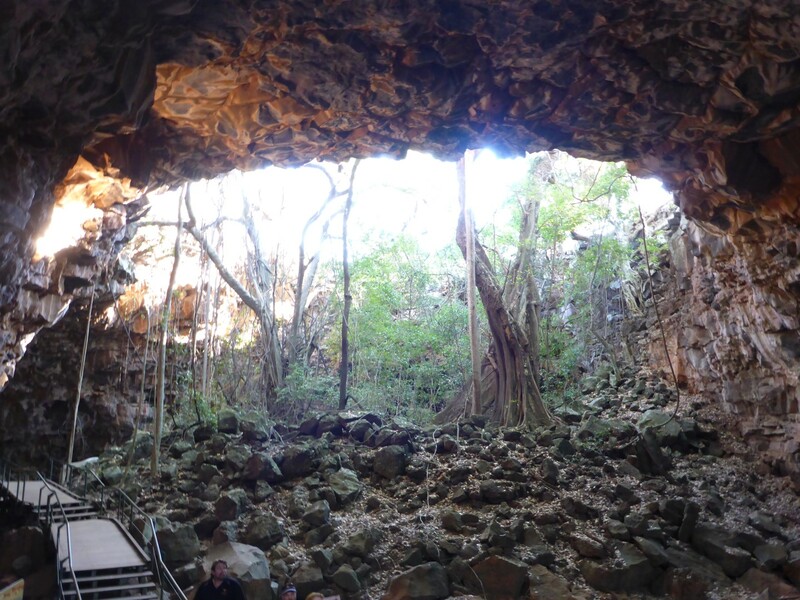 I was heading for the Undara National Park to find out about the lava tubes. 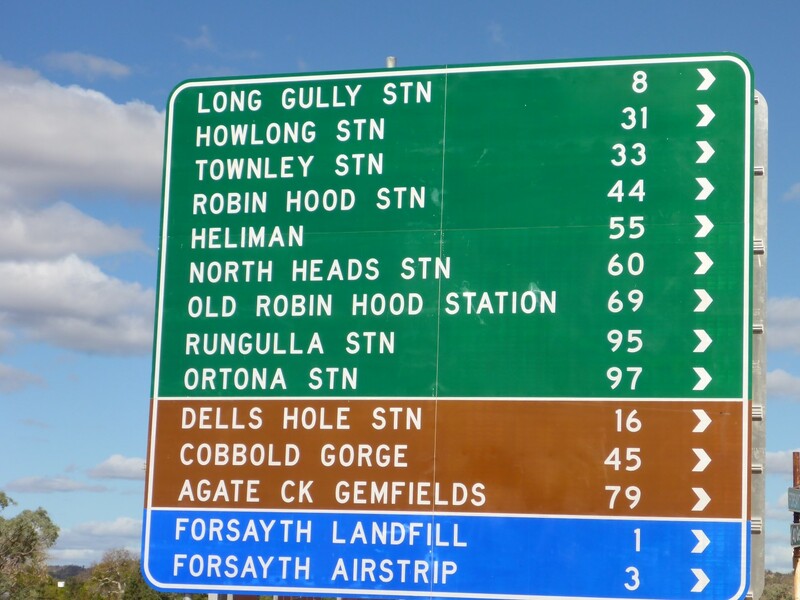 On the way I spent a night at a camp site in the village of Greenvale, another former mining town, nickel this time. At one time it was completely run down and was likely to be demolished until a millionaire businessman passed through in 1994 and decided to buy it from the mining company, thereby saving it. 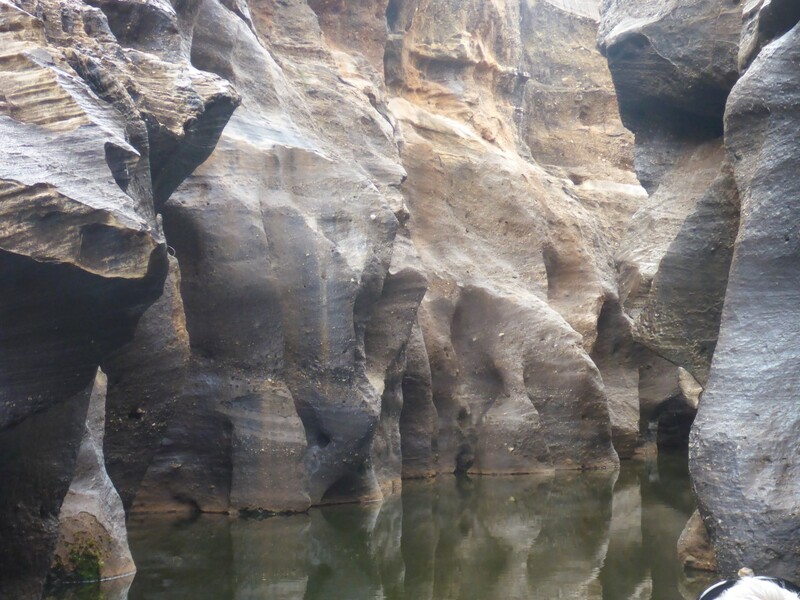 It is now a tourist attraction but is also helped by new mining activity in the region. In the village is a filling station/shop/café where I got a nice meal of grilled fish. I’d noticed that many places offer their fish battered, breaded or grilled, great for the health conscious eater. The absence of batter allowed me to have chips! 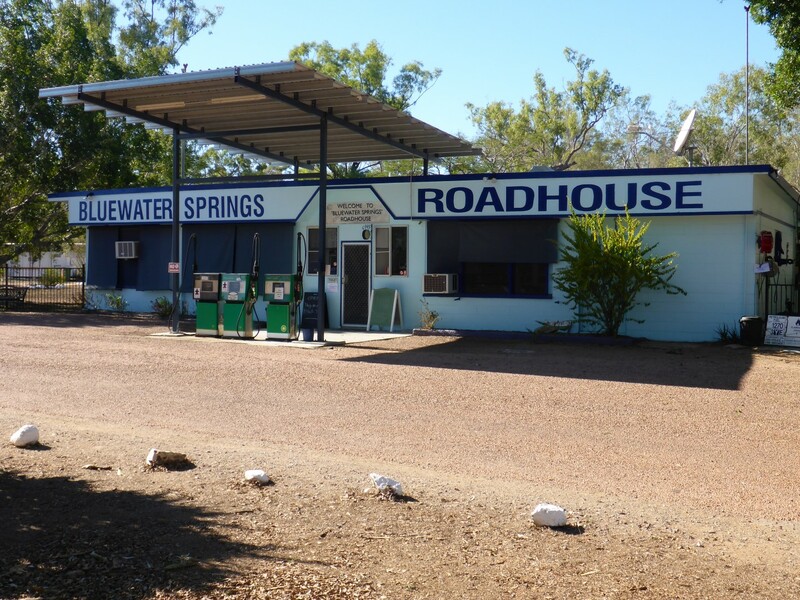 A typical outback roadhouse. Food and fuel. The wildlife changed as I moved north. The camp site had plenty of Galahs in residence and I’ve begun to see kangaroos in the brush as I ride past. Great as it is to see them they can be a real danger to drivers and, especially, motorcyclists. The standard warning is to avoid travelling at dawn or dusk because they have a habit of running out in front of vehicles at the last moment and invariably get struck by it and die. 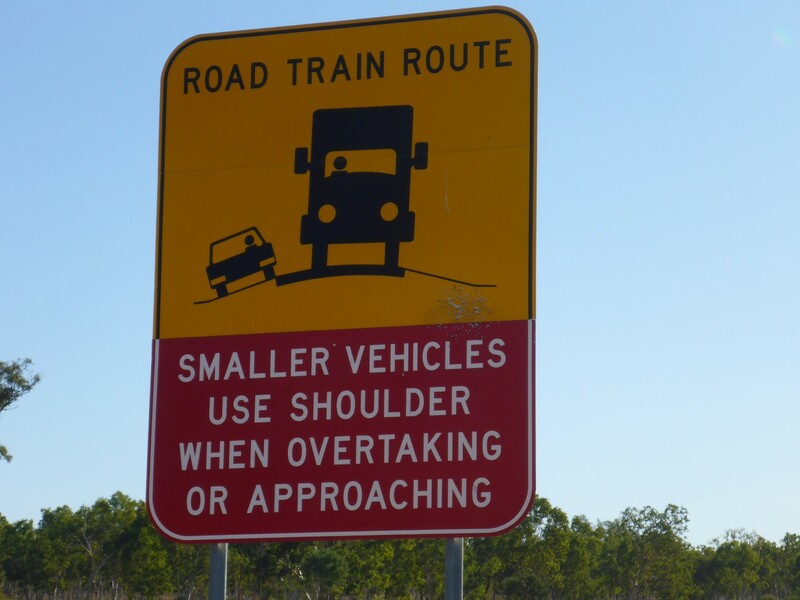 Not a problem for truckers, a major headache for bikers as they invariably come off worse. I saw at least a dozen dead ‘roos on, or next to, the road. I was definitely in the outback now. Nature in the raw. Just the road and the land it passed across, nothing else. When you see a sign like this …..
… on a road like this …. … you’d prefer not to meet one of these. It wasn’t far to Undara Lodge and I’d rung up and booked a tour for the afternoon. Once the tent was up I enjoyed some of the free coffee while I waited. This site is very well laid out and every pitch has its own fire circle, with a billy holder at one side. It seems that Aussies like to get out and live their folk stories, so fire pits are very common. One really nice feature of this site is the railway carriages that have been converted into accommodation and facilities buildings. It seems the owner saw them one day when at a cattle market, parked up in a siding with grass growing around the wheels. 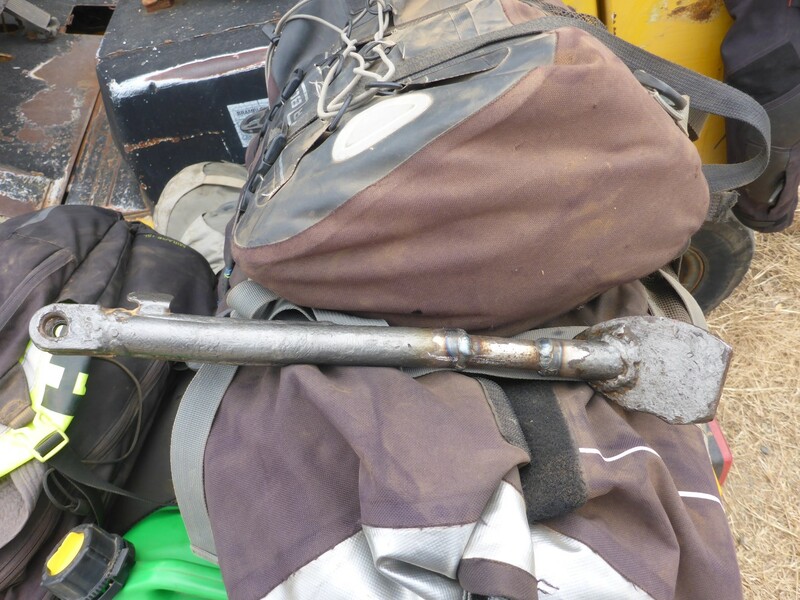 He had them refurbished and trucked out to the camp site. Imaginative use of railway stock. Undara Lodge is in a national park but the land used to belong to Whitewater Station, set up by the Collins family in 1862. When the lava tubes were discovered they began to take visitors to see them and the business grew from there. They lost the land when the national park was created but were given a seventy five year lease for running the tours. I mentioned before how tough life would have been for settlers. One fact I discovered was that before roads were built the return journey to the coast to get supplies took three months. Three months! It knocks ‘just popping down the shops’ into a cocked hat. On the ride up I’d travelled along several roads whose name included ‘developmental road’. I stopped at a monument on the Hervey Developmental Road, named after the landowner who cut it through the bush. It enabled him to drive his cattle to market far more easily and as more stations were settled in the area the government took it over. For most of its life it was gravel but now it’s bitumen. I suspect the growth of trucking and the tourist trade has a lot to do with that. Most of the roads in the area have a similar history. The towns on the coast grew up partly to supply these stations and to ship out their livestock, so the roads became vital links for them. Essentially, they lived up to their name. 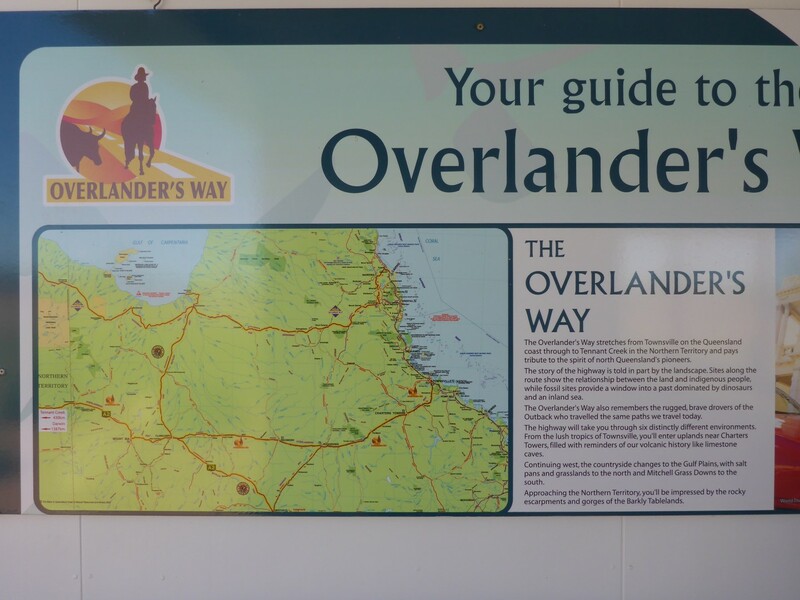 Signs such as this one tempt Aussies to explore their heritage. At 15.30 we set off in our minibus with Tracie, our guide, at the wheel. She told us all about the Collins family, how they developed the land and about the creation of the national park. We saw a kangaroo and she explained about the six different types that can be found. She also told us about the problems with animals such as feral cats, dogs and pigs. These animals are allowed to be hunted as they are considered a pest. She told us about the spear grass too. Arched entrance to a lava tube. 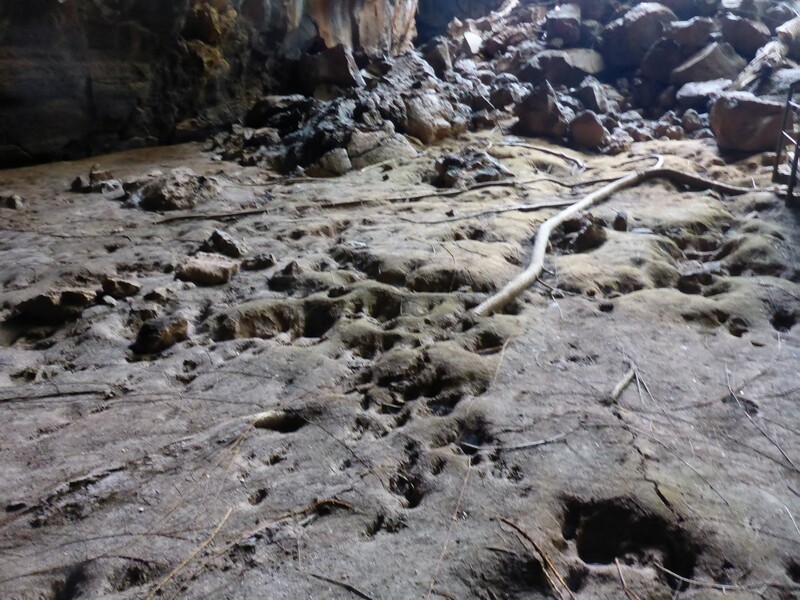 So what are lava tubes? The area has ninety four volcanoes in it, of many different types. The Undara Volcano was of the type that didn’t explode but was where the lava simply oozed out of the crater. It did this for a long time and at high volume, estimated to be 1,000 cubic meres per second – about enough to fill an Olympic sized swimming pool. It covered the landscape to a great depth and some of the lava ran along watercourses or depressions in the ground. In this instance the top level of lava cooled in the air and solidified but the lava underneath, now kept even hotter, continued flowing. Eventually it stopped but left behind it the tubes through which it had flowed. The longest one is 160 kms, the longest in the world. 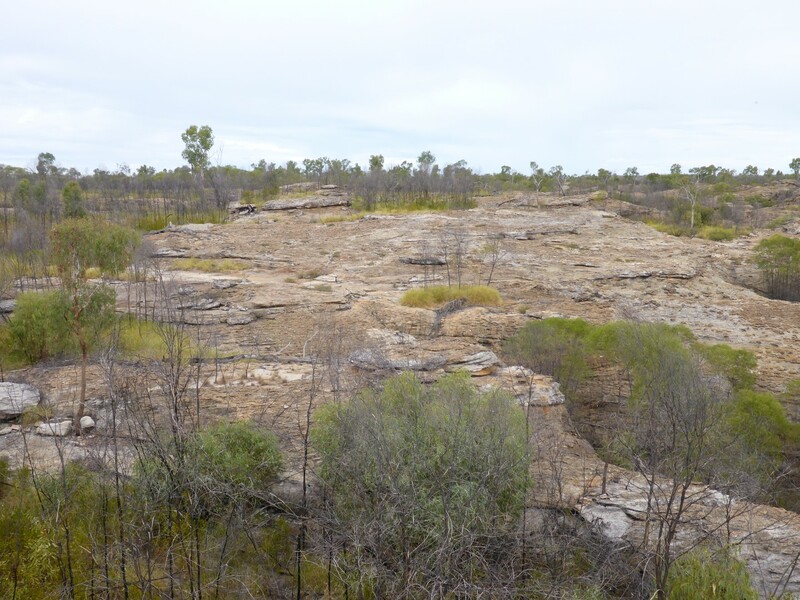 They were discovered in 1960 and studied by various geologists from Cairns University. Over time the roofs have collapsed in many areas, allowing trees to thrive on the water that flows through them. Looking over the landscape it is easy to see where this has happened because there are pathways of greener trees across it. Even so, the longest tube is still 100 kms and there are many sections that have yet to be explored. The fig trees constantly search for water. 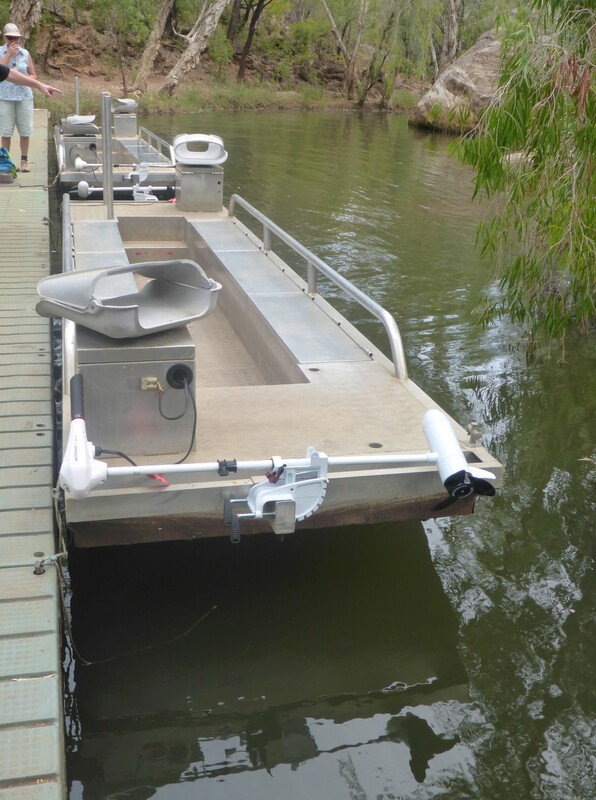 Undara lodge have done a great job in making them accessible. By special arrangement they can even get wheelchair bound people down into some sections. We walked down wooden steps and along boardwalks into the tube. There are sections were roof collapses have just left archways but further on we walked into the tube itself. 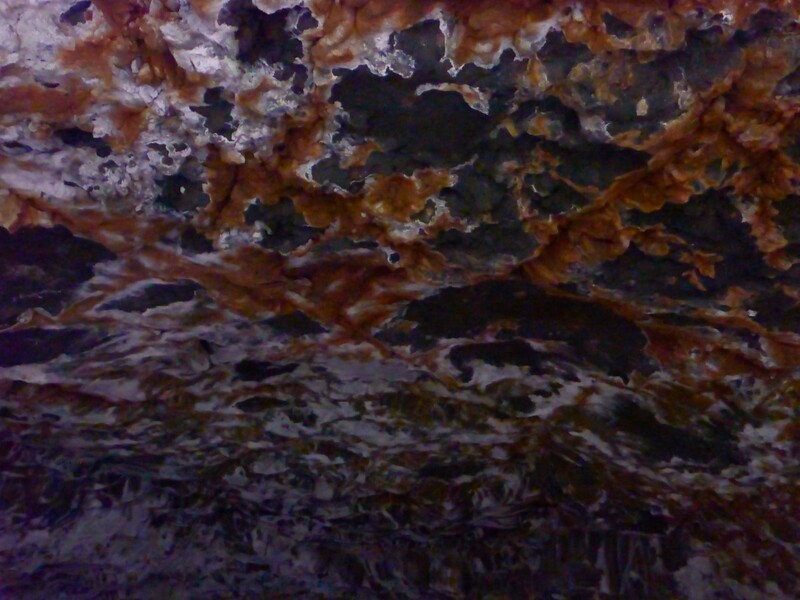 Water leeching through had left some amazing patterns on the roof and walls, looking almost as if they were cave paintings. Fig tree roots had worked their way along the rocky floor seeking water and they looked like the tendrils of some jungle plant coming to get us. 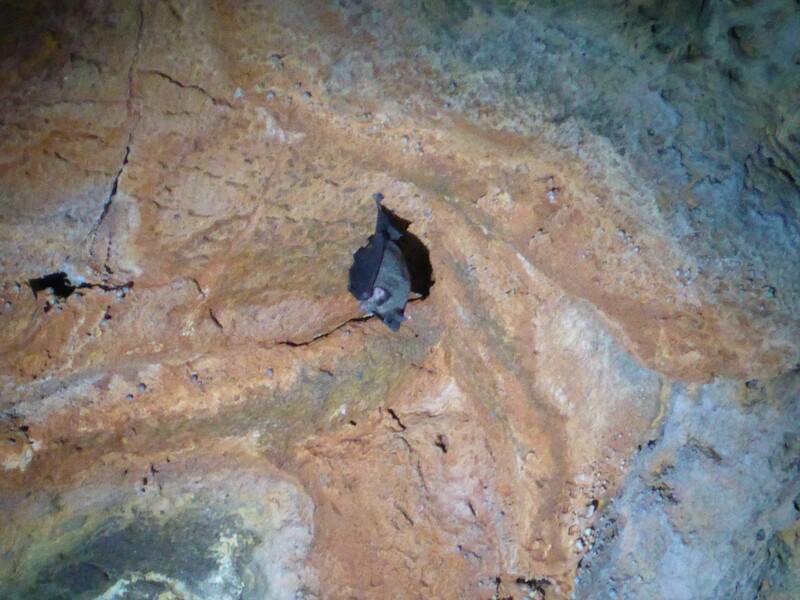 In the second tube we visited we saw small bats hanging from the roof. This tube is damp, just right for the bats and just right for the snakes which hang from tree branches outside waiting for their meal to fly by so they can grab it. What a fascinating place and proof, if any were needed, that nature invariably provides greater wonders to behold than man ever could. We just have to wait a while – 190,000 years in this case. Another surprising revelation from Tracie was the explanation she gave for the obviously recent fire damage at alongside the track. 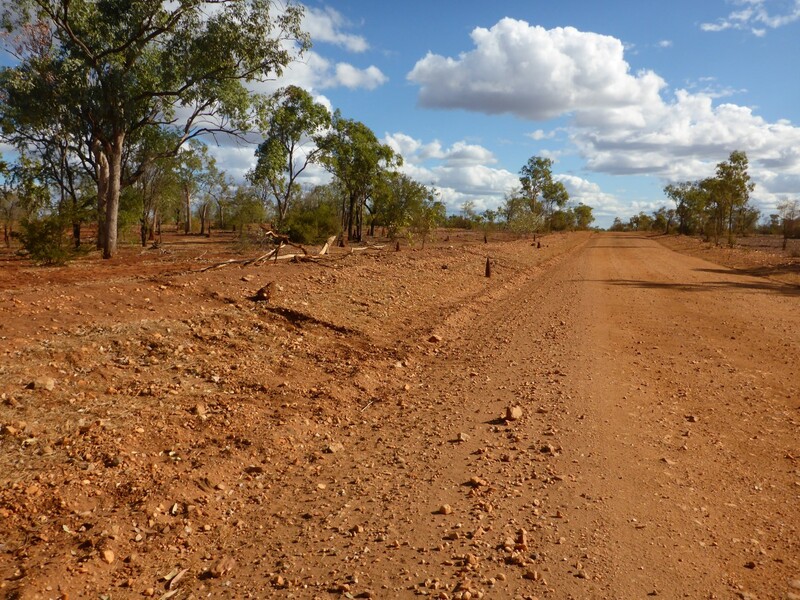 The ‘dry’ (dry season) has just begun and bush fires are a huge risk to the outback. Three weeks ago, while the grass was still damp and mornings still produced dew, they set fire to the grass. The biggest surprise to me was to learn that they then leave the fire to its own devices, with only the most casual monitoring taking place. It seems that everything is damp enough for the fire to burn itself out quite quickly but its effect is to eliminate available fuel to any subsequent bush fire. The grass begins to regenerate, but slowly. The trees are charred for about two metres up their trunk so won’t catch light. 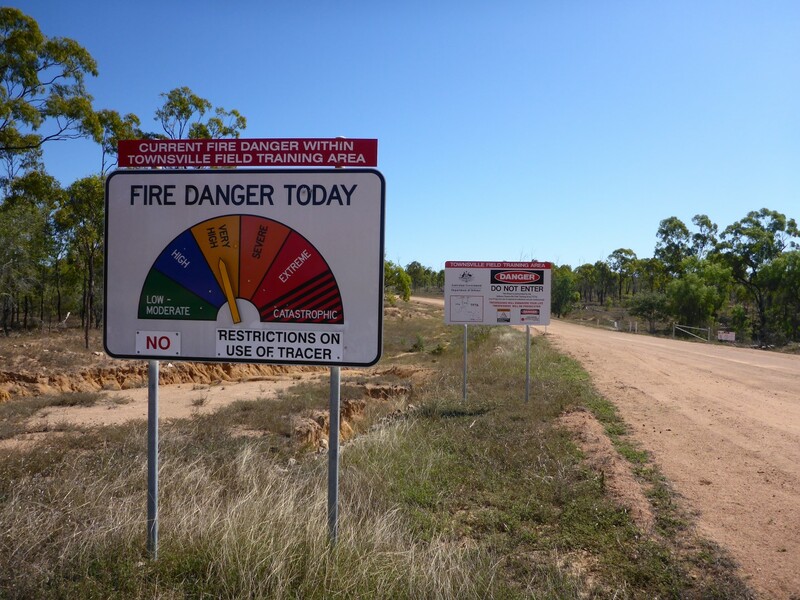 Along with the tracks that provide fire breaks, the risk is reduced significantly. The fire spreads slowly enough for animals to escape it although birds of prey will tend to hover along the edge waiting for lunch to come their way ahead of the flames. It’s up to each landowner to undertake this process if they choose to. Undara Lodge protects itself by fighting fire with fire. 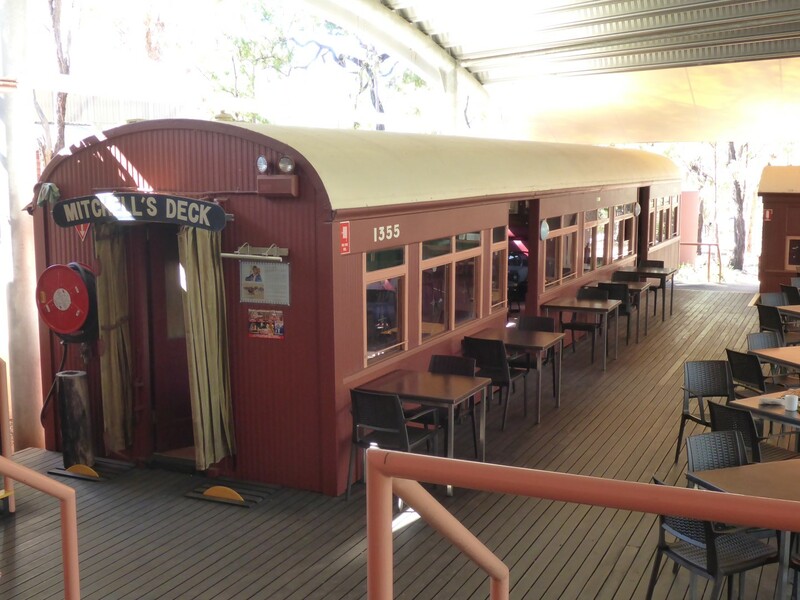 In common with most tourist attractions in the outback, their season runs from April to October. The wet season arrives soon after and access is very difficult and the heat and humidity can be extreme. Most of the clientèle are grey nomads but at the moment the schools are on a two week break so there’s plenty of families too. What a fantastic place to take your kids. 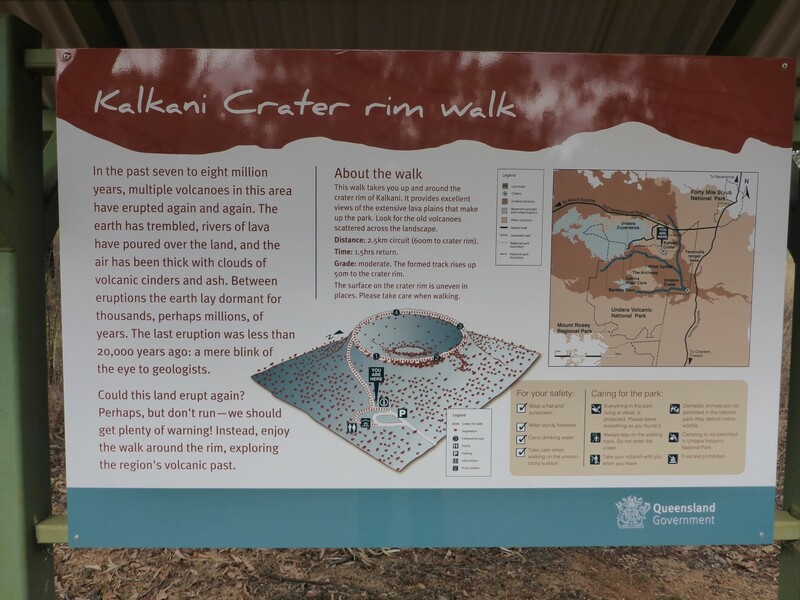 When I left Undara I diverted slightly to look at the Kalkani Crater. This is a ‘traditional’ volcano, and has a nice round crater with a path all round it. Looking across the landscape from its height of fifty metres, and using the interpretive signs provided, I could see many of the other volcanoes including Undara which, given how productive it was, just looks like a low hill in the distance. It was easy to see where the lava tubes ran by tracing the darker green trees across the horizon, marking the collapsed roofs. At the Kalkani crater rim. Geological history. As I headed north then west the terrain changed subtly. It became even drier, the scrub and trees thinned out and the grass was now lemon grass rather than spear grass. There were almost no dead ‘roos here, suggesting the land wasn’t productive enough to sustain them. It had got hotter too. 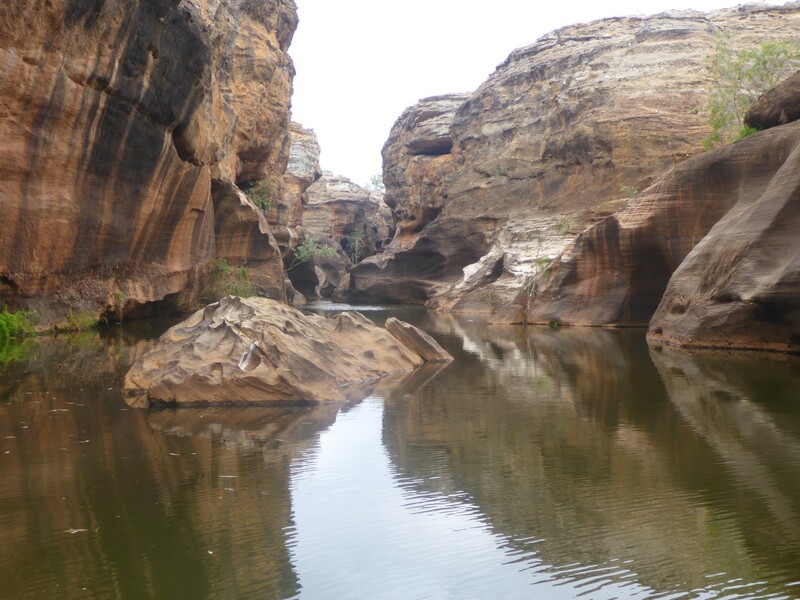 My destination was Cobbold Gorge, another one of nature’s wonders. 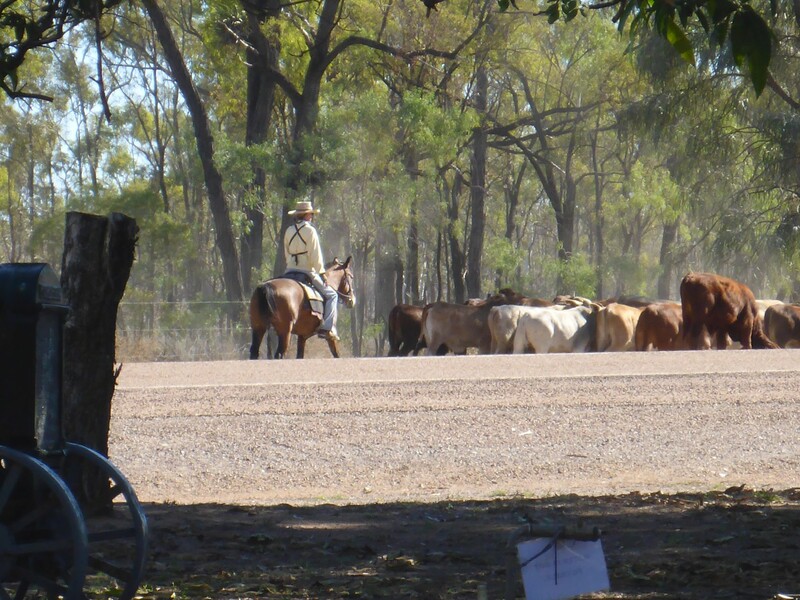 It is situated on a large cattle station and twenty one years ago the owners started a small tourist business, with visitors bussed in from the nearest town. 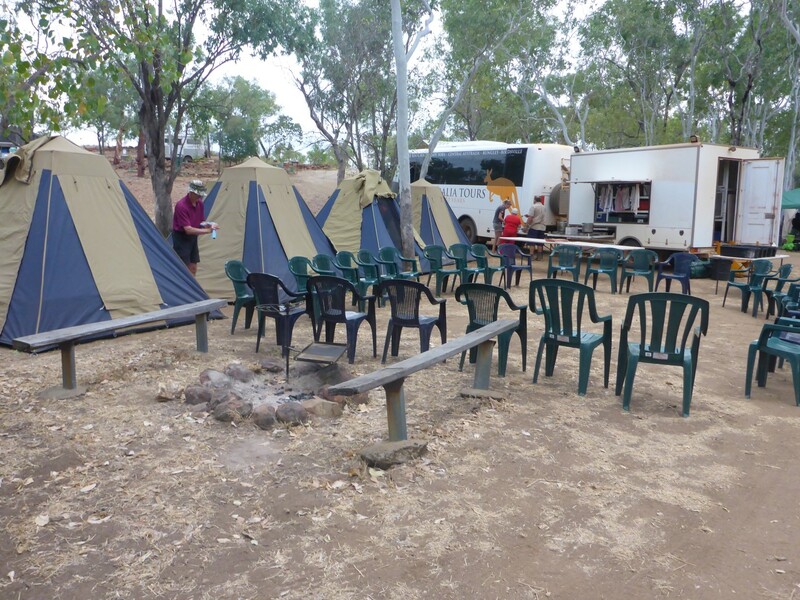 Today it has become a camp site and tourist centre with a variety of accommodation options. Good facilities once more, and a cheap enough rate for a man, a motorcycle and a tent.This was my seventh night in a row under canvas and pitching it is getting quicker all the time. Camping on sites like these is no hardship really and I’ll have several more nights in the tent before I see the inside of a hostel again. The road down to it was gravel and had become corrugated in places. I was very pleased that I had decided to renew my tyres. Nice gravel track down to Cobbold Gorge. One of the signs along it, giving us some idea of the number of stations the road leads to and also how remote they are. I booked onto the three hour long Gorge Tour, starting at 13.30 next day, and settled down to relax and write for the afternoon. Next morning I even had a lie in and still had plenty of time to catch up on more writing. We met for the tour at reception and boarded the bus with our two guides, Gemma and Jamie. As we drove down to the gorge area Jamie explained some of the history of the station and also some geological background to the gorge. We were outside the volcanic area and the rock is all sandstone. It seems that fissures opened up, probably caused by earth movement, and water took advantage of the new routes. 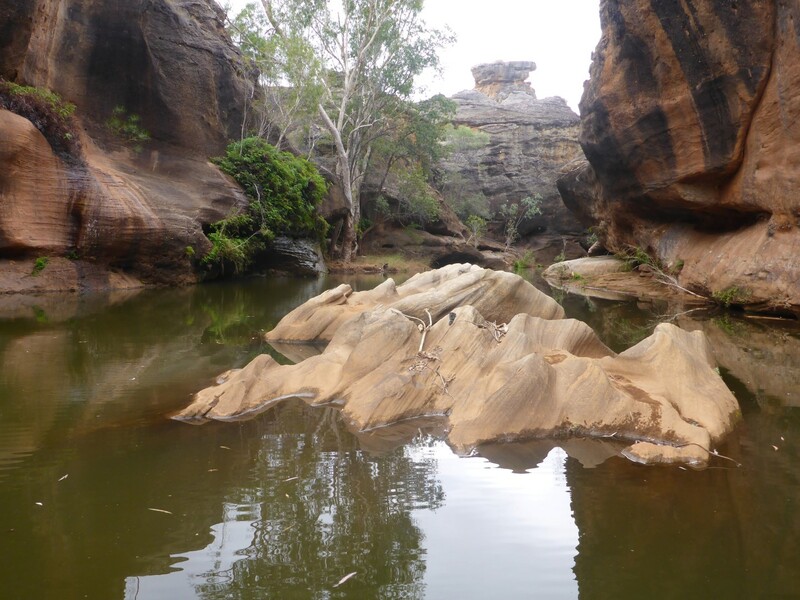 Unlike others in the area, the river that runs through Cobbold Gorge is fed by underground springs, so never dries up. The level rises significantly during the wet of course, and this has the effect of clearing and refreshing the water. Normally then, the water is very clear but the wets over the last three years have been limited; 290mm of rain instead of the usual 900mm. The rain tends to arrive in a rush as the summer starts so although the annual figure seems to me to be quite low, its effect can be drastic. The Robertson River runs through the property. At the moment it is just a dry, wide, sandy riverbed but the water level marker posts on either side of the steep banks go as high as eight metres. That’s why these tourist places are seasonal. Very little plant life on the top. A bark shedding Malalaca tree. 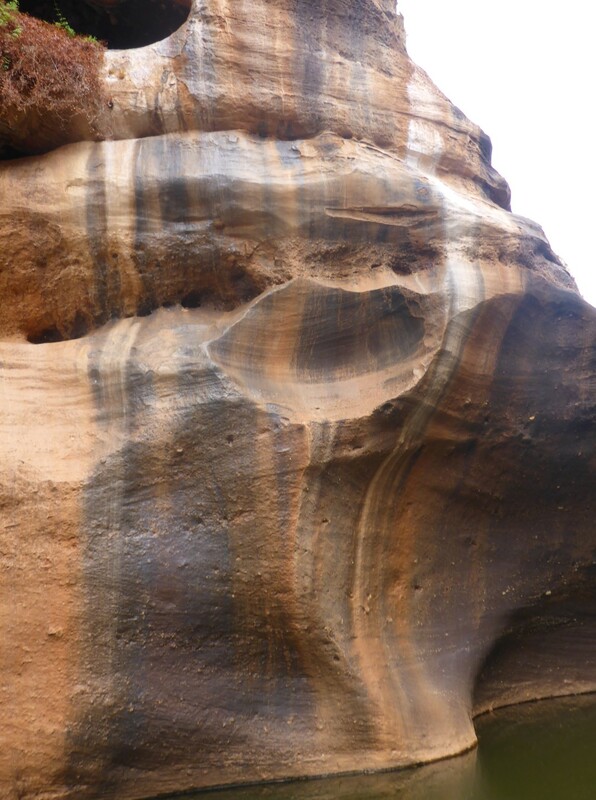 We were going to take a boat ride down the gorge but first we walked up the sandstone escarpment through which it runs. On the way there I was fascinated by some Malalaca trees, or paper Bark trees. They constantly shed their bark in very thin layers which really do feel like paper. 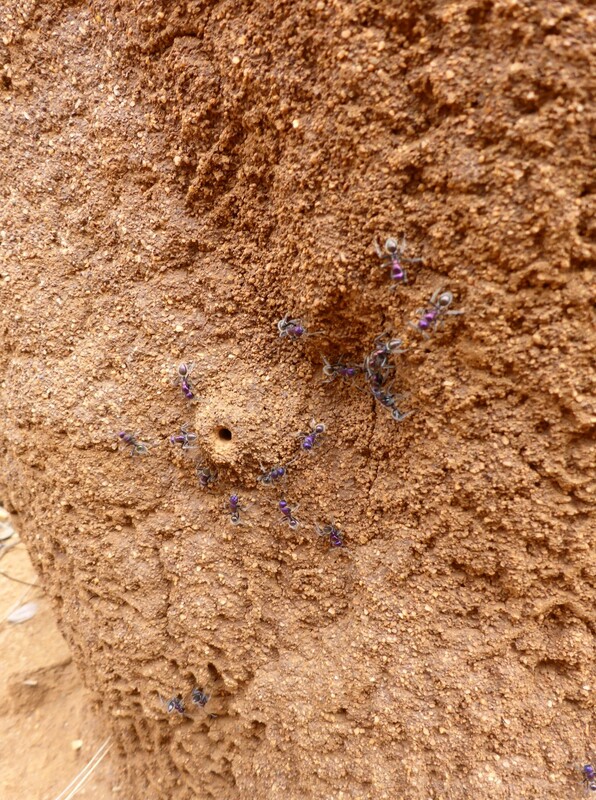 We walked past a termite mound on the outside of which were some ants. They looked most peculiar with their blue bodies and their backsides stuck into the air. It was at this point that I realised the mounds I thought were ant hills actually housed termites. Jamie told us about their lifestyle. They spit out a kind of glue that binds the dirt together as they build their nests. There is a King and Queen inside. The Queen can live up to one hundred years and will have several Kings in that time. When the Queen dies the nest dies too and the termites go off to start again. The farmers like to see their nests because this type eats grass. The cattle eat the young, green shoots but can’t digest the older stalks. The termites can and as they digest them the protein held within goes back into the earth. How fascinating. We climbed up the rocks, admiring a rather smudgy Aboriginal rock painting on the way, and came out on the top. There was not much to see but rock. And this is the point. I had expected to see shrubs and trees growing on it but there were very few. My guess is that it’s simply too dry most of the time for any to take hold. We could see more of the sedimentary layers of this former seabed, with different minerals running through them evidenced by changing colours. There were rocky outcrops but the area was mostly flat. It did look strange. We could peer over the edge of the gorge too, a taster for the trip along it. I’ll stop trying to describe it because the pictures do a far better job. Once back down we walked to the boarding point and got into the electric powered boats. Curious as to how they charge up the batteries this far away from the main buildings, one of the others spotted some solar panels. Riddle solved. The ride through the gorge and back was fascinating. It isn’t very wide at any point but it still narrowed down to about two metres across at the furthest end. 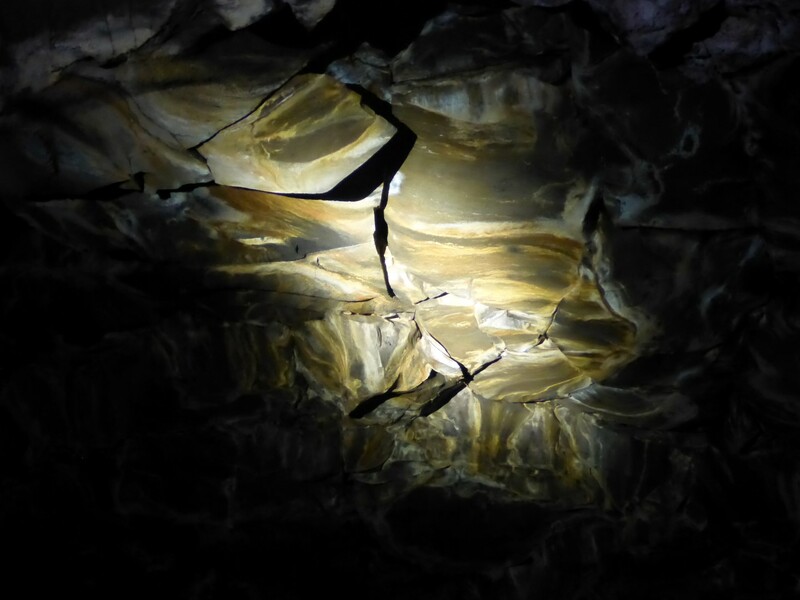 The most common mineral here is iron and the water that rushes through in the wet has polished the surface of the rock to a dark, dull sheen, very smooth to the touch. Up above the water line the vertical and horizontal stripes from the minerals looked amazing. 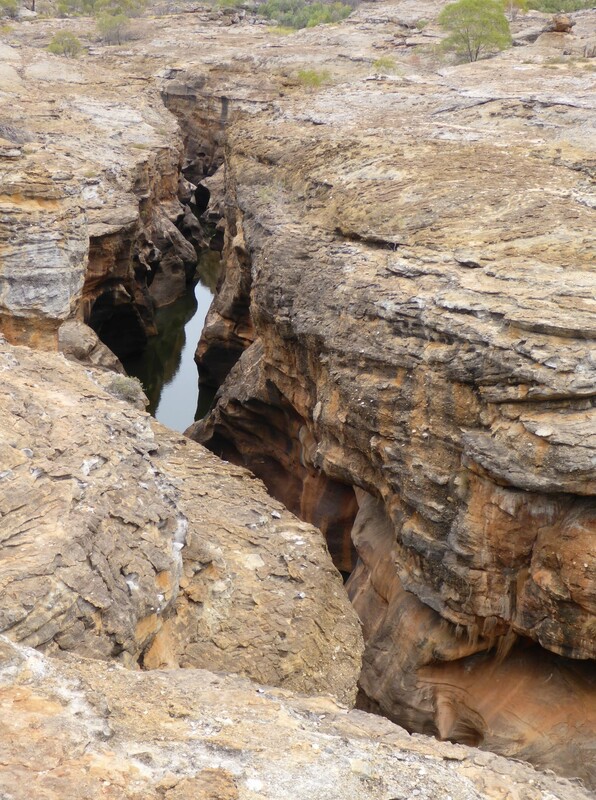 I asked Jamie if the two halves of the gorge would fit back together and he said the geologists reckoned they would. I kept checking various parts, wanting to be convinced. I was. The minerals colour the rock. It is worn smooth by floodwater, up to about five metres. As we crossed the river on the way back Gemma pointed out the Spear Pump, which goes down about 20ft into the river bed where it finds the stored water underground. It’s very safe to drink, having been filtered through layers of sand, and is pumped straight up to the accommodation area. Huge parts of Australia get their water in this way. That was an excellent tour. I love geology and things like this fascinate me. To me it’s comforting to think that our planet just gets on with going about its business and the affairs of mankind don’t really matter one jot. In theory, these rocks would mate up again. Calm and still down in the gorge. Back at my tent, just as I was cooking my dinner, a bus pulled in with a load of oldies on board. Their tents were unloaded and they put them up all around mine. I was surrounded by greybeards! Nice, friendly people though. They were on a seventeen day trip from Broome, Western Australia, to Cairns. The tents are shaped like beehives and very simple to put up. Peg the base to the ground, insert one pole in the middle and push it up, just like opening an umbrella. The trailer the bus was towing contained a kitchen and all necessary equipment.It looked like a great way to enjoy the outdoors without having to buy a 4×4 and camping rig. They were all well behaved too. My usual morning routine when I’m camping is to get up, eat, pack my gear away, take down the tent, load everything onto the bike and go. This particular morning all went well until I came to leave. As I got onto the bike the side stand snapped. I didn’t drop the bike or anything and I stowed the broken part and set off. The nearest town with a welder was Georgetown and Bushey, at Bushey’s Tyres and Mechanicals was able to undertake a repair straight away. All I had to do was take the stand off the bike. So I leaned it against an old forklift truck, took it off and twenty minutes later I put the repaired stand back on. I’d previously lengthened it by combining two stands into one and it had broken because I hadn’t strengthened the weld. Bushey did a proper job and I’m confident it won’t break again. It was cheap enough, at $20, but the most pleasing thing was that he could do it straight away. Nicely repaired. Strong, if not pretty. But isn’t it funny how life smacks you in the face and then puts its arm round your shoulder and makes it all up to you? 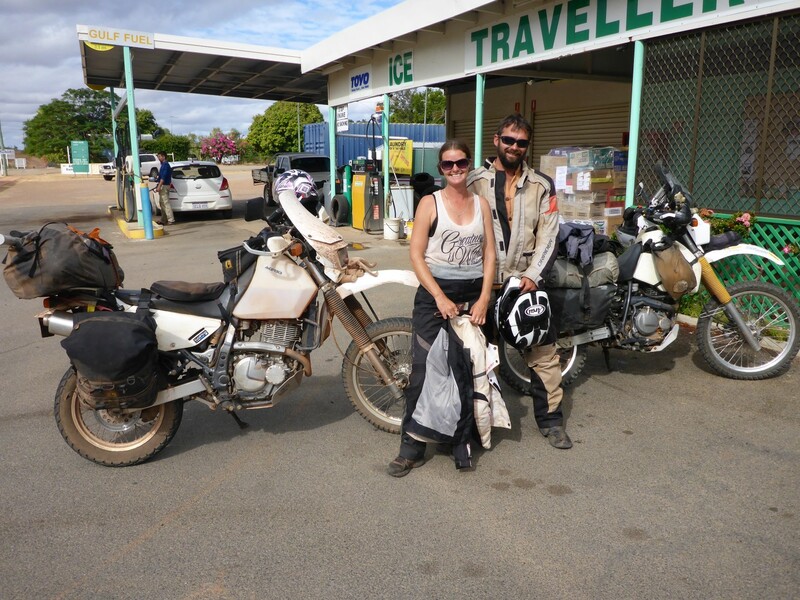 I went to refuel and at the garage/café I bumped into Luke and Kasey, two thirty something Aussies who are taking a break from their work to travel around Australia on a Suzuki DR650. We had coffee and a long chat and have agreed to meet up at the rodeo at Mareeba in ten days time. I’ve been wanting to go to an Aussie rodeo and this event is part of a two week long country fair, with camping available at the showground. I was really pleased about that. So if my stand hadn’t broken when it did neither of those two things would have happened. Ain’t life grand sometimes? Luke and Casey. DR650 mounted Aussie adventurers.